Sgt. Ericka Stropka attends a training session for the opioid deflection program. 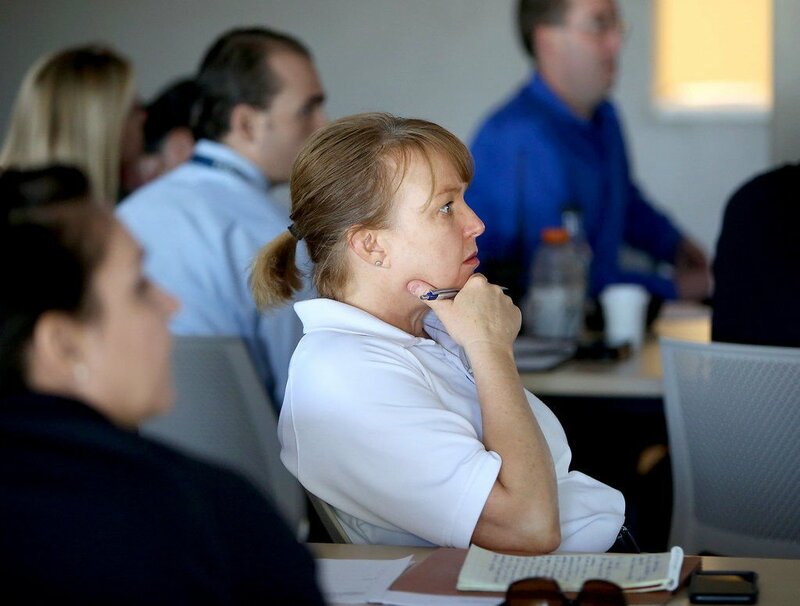 Detectives, sergeants and officers on the mental health support team have undergone the training. Dan Barden, vice president of clinical services at Codac Health Recovery and Wellness, talks to officers during training for the new opioid deflection program that gives addicts an alternative to jail. On a Tuesday in late May, Albert Flores, 63, appeared in Pima County Superior Court for sentencing on his most recent in a decades-long string of drug arrests. Flores was arrested in October with 0.13 of a gram of heroin and was charged with felony possession — his fourth drug-related felony in Arizona since 1995. Flores took a deal, pleading guilty to one charge of attempting to possess heroin, and the Pima County Attorney’s Office sought a sentence of a year in prison, but Judge Howard Fell said he felt the sentence was too harsh for a man who displayed a clear pattern of addiction. Flores told the judge that he wanted his life back and knew he needed help but had never been able to get it. Fell sentenced Flores to six months in prison, saying he recognized the man was ready to make a change, and urged him to take advantage of the treatment programs during his incarceration. Situations like Flores’ have become common in Tucson, as the opioid epidemic continues to engulf the community. Nationwide, overdose deaths are on the rise, and jails are being filled with addicts, who either aren’t ready or lack the resources to kick their addiction. But starting Monday, some people will have a new option to reclaim their lives and avoid arrest, as the Tucson Police Department rolls out a program it hopes could change the way drug addicts are dealt with by the criminal-justice system here. TPD’s opioid deflection program is a six-month pilot in two patrol divisions that will give opioid addicts the ability to be quickly placed into treatment with no risk of jail. The program is three-pronged and involves self-referral by drug users, deflection from being arrested and outreach by officers and caseworkers to connect with people who recently overdosed or fell out of drug treatment. Assistant Police Chief Kevin Hall began working on the program about 18 months ago, after he returned from a conference in Washington, D.C. The opioid crisis is notably worse on the East Coast and has been a problem for longer, with cities working hard to find innovative ways to avoid overdose deaths and jailing the same people over and over again, Hall said. For the last three years, opioid overdoses have been the leading cause of accidental deaths in Pima County. Last year, opiate-derived drugs contributed to 189 deaths, a rise from 2016’s reported number of 177, according to records from the Pima County Medical Examiner’s Office. The initial goal of the program is to try to reduce overdose cases, but the effects could be further reaching, since most of the property crime in Tucson is driven by addiction, Hall said. The program was “shamelessly plagiarized” from models being used on the East Coast, but TPD developed a model that seems to be more robust, involving self-referral, deflection from arrest and active outreach. The self-referral aspect will allow opioid users to hand over their drugs at the midtown or westside substation and ask for help, with no risk of arrest. The drugs will be taken into evidence to be destroyed and there will be no record of the interaction other than a point of contact, Hall said. A representative from a substance abuse treatment center will either come pick up the person, or if no one is available, the officer will take the person to a treatment facility. The only exclusion will be people with felony warrants for violent crimes, but all others will be taken to begin an outpatient program. The deflection aspect will allow officers to use their discretion when they encounter a person with up to 2 grams of opiates — including heroin, oxycontin and other derivatives — and decide whether to arrest or divert them to treatment. “These officers see the same people day after day and can judge when they’re ready,” Hall said. Many of Tucson’s drug arrests stem from shoplifting incidents, so when there’s a victim involved — such as a store — the officer will allow the victim to decide if the suspect should be issued a misdemeanor ticket for the theft. Regardless of the ticket, the person can still be eligible for deflection, and no record of the drugs will be entered into the law enforcement database. Over the past several weeks, the roughly 175 officers from the midtown and westside divisions have been training at CODAC, a mental health provider, learning about addiction, the neurological effects of drugs, motivational interviewing and the specifics of what deflection is and isn’t. Hall said although he has experienced some resistance from officers, many of the more-tenured officers understand the current model of jailing drug users isn’t working. Because many addicts experience relapses, TPD has taken safeguards to protect those who might not get clean the first time. People who self-refer or enter deflection can’t be charged with a drug crime later if they relapse or leave treatment before it’s completed. Treatment will be paid for by program partners, who have a variety of funding sources, Hall said. TPD’s main partner in the program, CODAC, receives funding through the Regional Behavioral Health Authority, Cenpatico, and also receive funds from grants and the state to address drug abuse disorders and mental health treatment, according to Hall. In August, TPD will begin the outreach portion of the program, working with agencies to visit people after an opioid overdose or if they fall out of treatment. Officers will begin distributing naloxone, a drug used to reverse opioid overdoses, to known users in an attempt to curb deaths, with the primary focus being on pregnant women. The department is pairing with researchers from the University of Arizona’s Center for Rural Health who will evaluate the program. Hall is also in talks with the county to have the program become an unfunded part of the MacArthur Safety + Justice Program, which is designed to reduce the jail population by diverting people into treatment and behavioral health programs. As of April, the jail’s population had gone down by 15 percent from 2014, when the jail was nearing capacity. During its first three years, organizers focused their efforts on reducing the number of misdemeanants being kept in jail, and the number has dropped by close to 50 percent, data shows. As a result, the program is refocusing its strategies on nonviolent felons, many of which are drug users. The department is working with a variety of local agencies, including Simpatico, Banner’s Crisis Response Center and Community Bridges Inc. Depending on the success of the program, capacity could become an issue, Hall said. CODAC is able to take 1,000 more patients but will need to hire more doctors to prescribe withdrawal medications, such as naloxone, for which the DEA limits the number of prescriptions a single doctor can issue. If after the initial six months, TPD sees a reduction in overdoses or property crime, or an increase in people seeking treatment, the program will continue, Hall said. There’s no cost to taxpayers associated with the program. Naloxone is being issued through the state and Sonoran Prevention Works, and UA researchers are applying for a grant to pay for the evaluation. Hall anticipates some resistance from the community, given the tremendous stigma associated with drug use. For years, Tucson police and the Pima County Sheriff’s Department have been national leaders in the area of mental health and substance abuse issues, said Deputy Pima County Attorney Amelia Cramer. Cramer believes the program will help balance maintaining public safety while helping people affected by mental illness or addiction get their lives back on track. TPD and the Sheriff’s Department already have deflection programs in place for people in mental health crisis, and the County Attorney’s Office has been training law enforcement officers in crisis intervention for years, Cramer said. Recognizing the connection between mental health issues and addiction, TPD has also expanded its Mental Health Support Team, adding a sergeant and three officers to assist with the active outreach component of the deflection program, Hall said. “It’s an overlapping population, and (the TPD program) is an extension of the deflection program that’s already in place, with an important and significant addition,” Cramer said. Pima County Public Defender Joel Feinman said he is fully supportive of the program, calling it “exactly what we need” in Tucson. In February, the public defender’s office began analyzing data about felony drug offenders represented by its office and found that 33 percent of all felony cases in Pima County are drug cases, and 22 percent of all Pima County felony cases involved less than one gram of drugs, according to a memo from the public defender’s office. Experts in the field of opioid abuse think the program has potential in Pima County and believe it’s the type of strategy needed to combat the growing number of opioid deaths. But given that data regarding overdoses and hospitalizations is being collected faster, the problem could appear on paper to get worse before it gets better, said Dr. Daniel Derksen, director of the Arizona Center for Rural Health and a UA professor. Results are mixed when it comes to amnesty programs in other cities. Last year, Gloucester, Massachusetts, saw an increase in opioid deaths after launching its Angel program, which fast-tracks addicts to treatment. Philadelphia has also seen an increase in overdoses, despite multiple programs. As the number of opioid users in Pima County and across the nation continues to grow, Hospodar remains hopeful that Tucson’s deflection program will have positive results, even though she knows that it sometimes takes multiple failed attempts at treatment before a person is successful at kicking an opioid addiction. Criminal justice reform strategies developed in Tucson may gain traction across U.S.